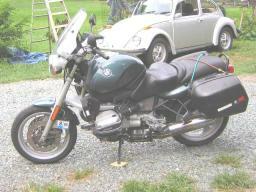 Welcome to my site about the BMW R850R. This is a 1996 R-series oilhead bike. Click any image for a larger view. 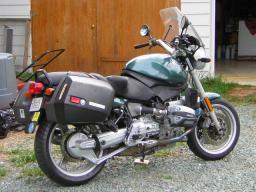 The R850 is nearly identical to the R1100, but has slightly smaller cylinders and pistons. I think the final "R" in R850R stands for "Roadster". 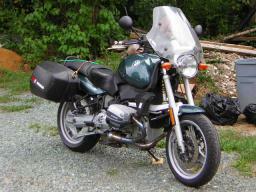 This is a street bike set up for short and long distance road travel. Unlike the RT and LT bikes, it does not have a fairing so it is kind of a naked bike. As far as I can tell, the R850 was only imported into the US for two years: 1995 and 1996. I think it is still sold in Europe. My bike has quite a few options. The center stand is standard, but the hard cases (luggage), low mount muffler, clock, tach, windscreen, saddle and cylinder head guards are all options. That's a Russell saddle, and it is comfortable. From this angle you can see the telelever front, and the paralever rear suspension. Yes, they work. Handling is superb, and I'm comparing it to the legendary Honda VFR750F Interceptor. The fuel tank is large, so the bike will go a long way between refills. There is no fuel gauge. However, the bike has a low fuel warning light, and I think it has a (roughly) 1 gallon reserve. There is no fuel valve. You can't really tell from this photo, but the handle bars are reaonably high and rear set, making for an upright, comfortable riding position. The R oilhead bikes have fuel injection, perhaps starting in 1995. These bikes are 2 cylinder, horizontally opposed (boxer) engines, with 4 valve cylinder heads, and overhead valves. The cam shafts are chain driven and are in the heads, but not "overhead" in the usual way. There is a short pushrod between the camshaft and the valve rockers. There is some air cooling, but the "oilhead" bikes are largely cooled by oil and have 2 small oil coolers. There is one on each side, just in front and above the cylinders. 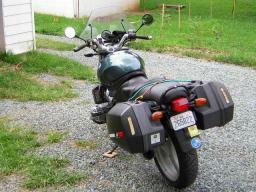 The hard cases (aka saddle bags, side cases, luggage) are large, and the bike is kind of wide. This isn't an ideal lane splitting bike with this luggage. I haven't measured the width of the cyliders, but I think they are narrower than the handlebars. The mirrors are wide set and very effective. The cases are really beefy. They are plastic, but much heavier construction than Givi (I like Givi, and Givi quality is good, but the BMW factory items are better). The mounting bars are thick and strong, as is the mount latching mechanism. The case closing mechanism is a kind of cam-lock double hook. This is also rugged. The mounting latch and case closing latches operate very smoothly. The case locks are matched to the ignition, so there is only one key. This is a really nice feature. The helmet lock is located in front of the cases, so you can use the helmet lock even when the cases are on the bike. Removing the cases is trivial. The mounting rails look intentional, as opposed to something that was bolted on. 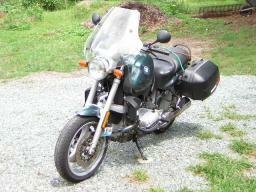 Without the cases the bike looks like a typical street bike - at least as much as a bulbous BMW can look "typical". Here is a good view of the rear paralever. The rear suspension is a single side arm, and the drive shaft is integrated with the side arm. Unlike older R and K bikes, the rear section of the paralever can pivot. I don't really understand "shaft effect" but apparently allowing the pivot with the lever (notice the lever below the shaft housing) counteracts shaft effect. I can attest that the bike corners really well. It is stable, nothing unpredictable happens, and I can hold my line through a turn almost effortlessly. Even better, if I want to change my line as I'm in a turn, that's easy too. On the other hand, the VFR 750F Interceptor often seemed to choose a different line than I did. It could be lack of practice, but I had the VFR for over a year. The Interceptor is known for it's predictable, stable handling. I don't think anyone would call the VFR "twitchy". Incidently, my VFR was a 1995, so technology on the newer Honda's is better. Amazingly, I don't get a lot of heat from the cylinders or oil coolers. The clutch is very smooth. BMW uses a single plate dry clutch like an automobile. The transmission up shifts very smoothly, with low effort. Down shifts are fine, although I often get a clunk dropping into first gear. Finding neutral is different from the Japanese bikes. In both my Hondas and the Kawasaki, there is a little 'click' going into neutral. Not the BMW. Neutral in the BMW is easy: just lift the shifter a little. Don't lift until it clicks. I've found that a gentle lift puts me into neutral nearly every time.